I am a massive film geek and love nothing more than snuggling down and watching a film. 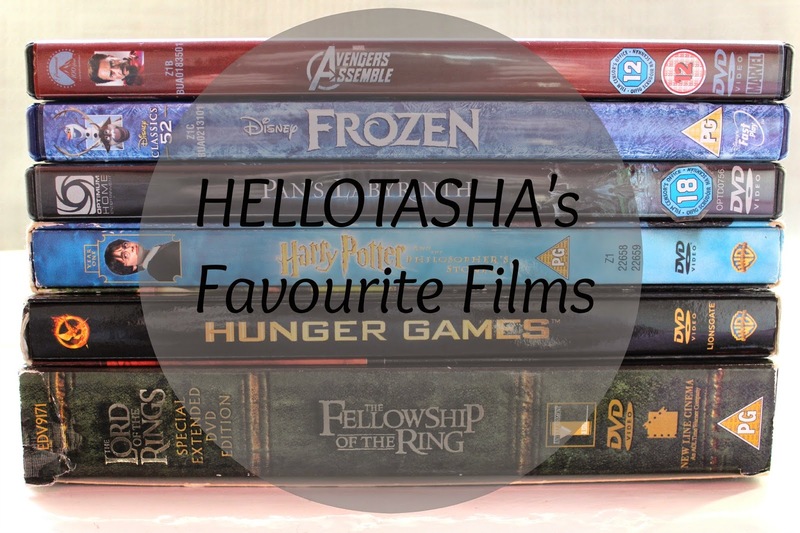 I actually studied Film Studies at College and then went on to do Film Production at Uni, yep big fan so thought it was about time I rounded up 10 of my favourite films. Now I don't think these are in any particular order as I don't think I would be able to do that as it's just too hard of a decision to make! Harry Potter: I am a MASSIVE Harry Potter fan, I loved the books when they first came out and when the films were realised they were everything I imagined them to be and more. I was genuinely sad when the films finished but they are the kind of films that I can watch in a long marathon and not get bored, ever. Hunger Games: Another book adaption that I love! At first I wasn't bothered about them as I didn't think the story was up my street but after reading the books this all changed. Personally I feel like the films are more better than the books but thats just my opinion. I'm yet to see Mockingjay Part 1 though, I'm such a bad fan but I just didn't have chance to see it when it was in the cinema so I'm desperate for it to come out on DVD already. Tangled: Such a cute film! It's based on the story of Rapunzel who I'm not going to lie I have always been jealous of her hair, long and blonde? Yes please! I love all the songs and the story etc, to me it's one of those films which I watch when I'm having a bad day and I will instantly feel better. Pan's Labryinth: I'm not too sure how many people will have heard of this as it's a foreign film directed by Guillermo Del Toro. It tells the story of a young Spanish girl in 1944 as she escapes into an eerie but very captivating fantasy world to get away from her brutal Army Officer stepfather. It's beautifully shot and the story itself is incredible, it is well worth a watch, even if it is a little odd. Pitch Perfect: Again one of those films that just picks me up when I'm feeling down. I have this on my iPad so when I was travelling around Australia it was my go-to film. I've watched it so many times now it's gotten to the point where I can quote the entire film, sing the songs and do all the dances. yes I am that sad. I don't think I will ever get bored of this film and I can't wait for the second one when it comes out this year. Wolf of Wall Street: This film is so awesome, it's unreal! I find it so hilarious and Leo DiCaprio (babe alert) fits the role perfectly! After watching the film I immediately wanted to read the book as it's based on a true story and the book is just as good. I highly recommend this film! Lord of The Rings: Another fantasy film for me, I think they are my favourite genre! Lord of The Rings in my opinion is just epic, the story, the way it's shot, everything about it it amazing. I think I appreciate it even more as I've visited New Zealand and visited where it was shot, Hobbiton etc and the country is so so beautiful and you can see Lord of The Rings on every landscape. Frozen: How could I not include this? I was very late on to the Frozen hype but I love it so much now! I sing Let It Go pretty much every day and generally just love everything about it. I don't love it as much as Frozen but it's still up there as one of my favourites. Urban Legend: This is another film where I don't know if many people have heard of it, Urban Legend is a horror film basically based on Urban Legends. I don't find horror films scary at all, in fact I really enjoy watching them and this is my favourite as there are so many twists and the killer at the end is so unexpected. Avengers Assemble: I love all of the Marvel films and I am a huge fan of them but out of all of them, Avengers Assemble has to be my favourite as it combines all the characters together and is just super awesome. I'm so excited for the second one to be released this year! What do you think of my choices? What is your favourite film?